The best portable CB radio will give you maximum flexibility. You can move easily from one room of your home to another, take it with you on a road trip or keep it on hand wherever your life takes you each day. The problem for many CB users is identifying the best radio for their needs the first time around. We want to help you find the portable CB radio that will meet your expectations now and in the future, so we created this guide to provide trustworthy information alongside detailed CB radio reviews. Selecting a top rated portable CB radio for your personal needs can take some time, but our portable CB radio reviews will speed up the process. Our goal is to highlight the pros and cons for some of the leading portable radios on the market today. If you want to attach your portable CB radio to your belt or use it while walking around, the Cobra HH 38 EX ST is the model to select. It comes with a range of accessories, including a belt clip, a cigarette lighter charging adaptor and a wrist strap. Cobra also stacked this radio with all the features needed to maximize functionality. It covers all 40 CB channels, including 10 weather channels. It also allows you to scan for active channels automatically. The sound quality is impressive on this radio, and it includes a high-quality microphone and antenna. The screen is also easy to read due to bright backlighting. The Midland 75-822 is one of the best portable CB radios made by Midland, and it comes with a mobile charging adapter that plugs into the cigarette lighter of any vehicle. You may also use the battery pack, which holds six AA batteries. The radio weighs less than half a pound, so it's one of the lightest CB radios on the market today. We admit that the reception quality isn't always the best, but this compact CB radio comes with a variety of advanced features that push its functionality above some competing models. The noise limiter and squelch control work together to reduce static and interference that can come naturally in many environments. You have enough room to store up to five of your favorite channels for fast tuning, and you can access all 40 CB channels. Other noteworthy features include automatic scan, last channel memory and easy access to 10 weather channels. You might consider the Uniden PRO401HH an excellent portable CB radio if you need something that is easy to operate. While it weighs about one pound, it has a slim design that makes it easier to hold in your hand, attach to your belt or tuck into your pocket. The most impressive feature on this radio is the high-low setting. You can turn it to low when you want to limit your range in order to save battery power, and the high setting allows you to maximize your range so that you can pick up more frequencies. There are no advanced features like squelch or scan on this model, but that makes it easy to use. It does give you access to all 40 CB channels. The best portable CB radio will give you the freedom to travel around your home and even away from home without sacrificing functionality. Many users start out with mobile or stationary CB radios for their vehicles or homes, but they also need the flexibility that comes with a handheld unit. Channels – The best portable CB radios will cover all 40 channels despite their smaller size. Charging Capabilities – You should have more options than using single-use batteries. If you will use your radio away from home, look for a unit that can charge in your truck or car or that uses rechargeable batteries. Squelch & ANL – These features are designed to reduce interference and static so that you can hear incoming transmissions clearly. Microphone – Portable CB radios typically have built-in microphones that you can't replace, so quality is important. 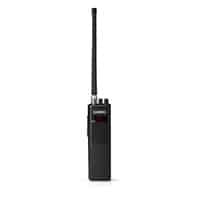 Accessories – If you intend to carry your radio on your belt, look for a radio that comes with a belt clip. There are other accessories that may sway you toward one radio over another, including wrist straps. It's also important to consider the overall reception and clarity when determining the best portable CB radio. We'll highlight all of these features in our CB radio reviews. While you may decide that any of the three radios reviewed in this guide fit your personal needs, we select the Cobra HH 38 WX ST as the overall best portable CB radio. It comes with the accessories needed to safely carry a radio while moving around, and it offers an impressive selection of features and clear reception.